Thoughtful Thursday: Eco-Friendly Architecture — Heart & Soul PR, Inc. The future of sustainability is here. 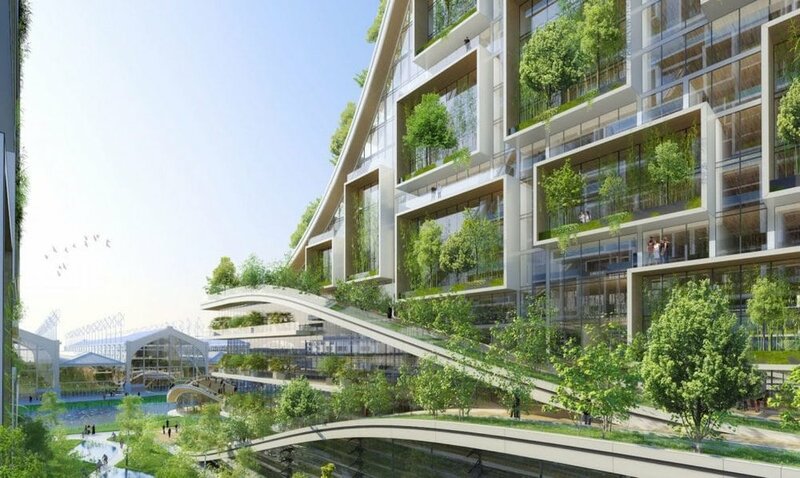 Vincent Callebaut is one of the world’s leading ecological architects. He is most famous for his futuristic designs in which he promotes the use of the earth to power his designs. Callebaut’s projects are sustainable using renewable energies, biodiversity, and urban agriculture. Not only do we love his thought provoking his designs, we love the thought put in behind them. One of his new conceptual design projects will transform Brussels’ historic Tour & Taxis into a sleek, futuristic eco-village geared towards young professionals. The neighborhood is located along the Brussels canal and will be made entirely energy efficient. The core of the neighborhood is centered around three landscaped buildings that resemble ski jumps designed with a futuristic touch and lush greenery. We can’t wait to one day visit this garden paradise!